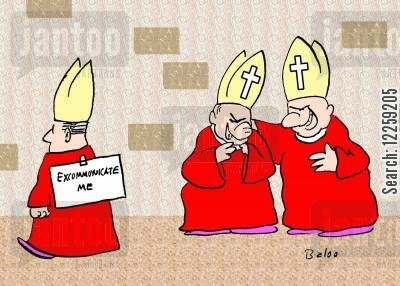 The Kikos and Dianas have a fetish for the word "excommunicate," usually leveling it at us and specifically me. 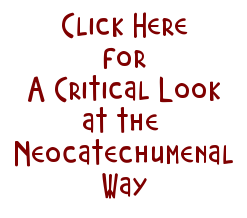 It's laughable, and continues to prove the ignorance inside the Neocatechumenal Way, however, in general, it is a discipline not well understood by most. This article by Cathy Caridi, J.C.L., in Canon Law Made Easy, is a good introduction. Have a good Sunday. From this article, It would seem that only Quitugua, and Adrian (If he ever completes his canon law studies, obtains a degree, and certified a canon lawyer) is qualified to be excommunicated. I say we start a protest to get this process going. Quitugua Out! Crystal No-Balls Out! Read the articla again and you will see that Adrianne is not subject to excommunication, since 1323n6 basically states per the article that "no Church sanction can ever be applied to anyone who is insane, senile, or mentally handicapped..."
So even if Adrianne does finish his matchbook canon law degree he would be exempt from sanctions. I'm not sure if I should pity him of donate some of my miles to get him a one way ticket to Kikoland. I stand to be corrected, You are correct. I failed to take into account the mental impairment of Adriana. I guess that would apply to Quitugua also since he is always sick in the head. But that would also mean that Diana would qualify, as there are many times when it appears that the lights are on, and no one is home. 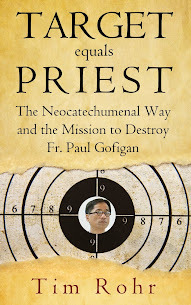 The whole damn NCW should be publicly excommunicated based on their grossly heretical catechesis and blasphemous liturgical abuses. They don't even believe in the divinity of Christ!! If that isn't enough to 86 them, the institutional Church is truly dead and the Faithful owe it no allegiance!! It is known by its leaders to be devoid of the Holy Spirit and therefore they are knowingly involving us, their ordinary membership fodder, in blasphemy against the Holy Spirit. The emotional abuse, organisational ambiguity (lies) and financial abuse are blasphemous. No diocese anywhere in the world should be having any truck with them. The last thing the English RCC needs on its hands at a time like this is yet another scandal, but that is exactly what they now have. Objectively, there is no covenant, guarantee, tie, bind, bond, oath, vow or promise. It is an errant trajectory of malformation. So-called "approvals" and "statutes" are the product of attrition and enforced fudging. "Initiating Christians" doesn't take 27 years. Neither does it take the advertised 10. In relation to the phrase "insert into the Church" note the subtext in the word "insert". Just saying, as an insider.